An encouraging collection of short stories by bestselling middle-grade authors.This one-of-a-kind treasury brings together the talents of nearly two dozen bestselling middle-grade authors including Shannon Hale, Brandon Mull, Ally Condie, and Jennifer A. Nielsen—who have created original short stories and modern-day fairy tales, based on the lives and dreams of children they have met who all have two things in common: they have very big hopes and dreams, and they are all cancer patients. 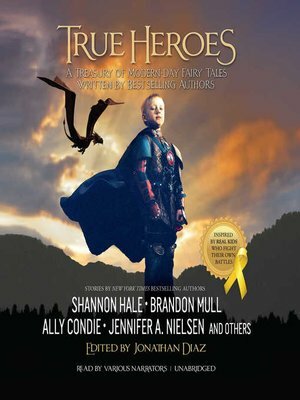 Each short story is prefaced by a brief bio of the child and is accompanied by photographs of the child, fully costumed and digitally inserted into a background—a baker, a dancer, a superhero, a dragon fighter, a sports star, a princess, and more—that makes them the hero of their own modern-day fairy tale story written by one of their favorite authors. Kristyn Crow was born in Southern California, the eldest of seven children. She is the author of Skeleton Cat, Bedtime in the Swamp, and the Zombelina series. Sara B. Larson can't remember a time when she didn't write books, although she now uses a computer instead of a Little Mermaid notebook. She lives in Utah with her husband and their three children. Jonathan Diaz is an attorney by day and a photographer by night. When he isn't taking photographs of mermaids, dragon riders, and fairies, he enjoys spending time with his wife and family. Liesl Shurtliff is the author of Rump: The True Story of Rumpelstiltskin. A graduate of Brigham Young University, she now lives in Chicago with her husband and children.